SoC-e – Ethernet communication solutions based on FPGA technology. 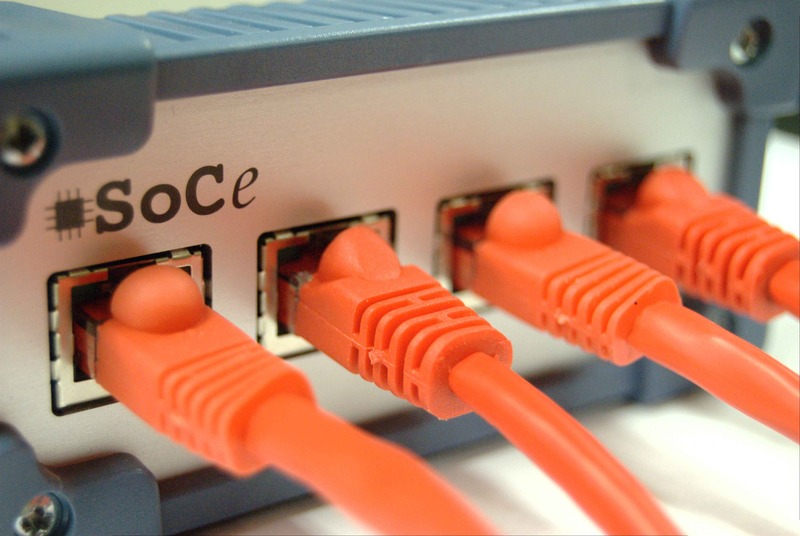 SoC-e is pioneer in developing a portfolio of IP cores that implement the leading-edge networking and synchronization technologies for critical systems. SoC-e has invested a large effort on R&D activity to develop optimized hardware and software architectures to face the challenges that have arisen when implementing these standards. In the same way, SoC-e takes part in most of the interoperability events contributing to the testing and spreading of these new technologies. In order to allow this intensive R&D activity and in internationalization, this company has reinvested all the profits since its creation and it has enforced its strategy with the integration of SoC-e in Etxe-Tar Corporation, an industrial group reference in innovation. SoC-e’s Managed Ethernet Switch (MES) IP core is a non-blocking crossbar matrix that allows continuous transfers between all the ports. It implements a Store & Forward switching approach that fulfills Ethernet standard policy regarding frame integrity checking. The switch buffers and verifies each frame before forwarding it. Nevertheless, the latency time has been minimized to nanoseconds order. 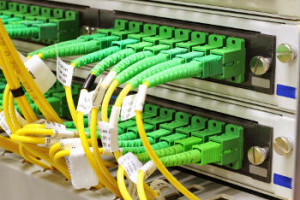 Consequently, MES is the perfect switch to implement Ethernet based Industrial Networks. MES can be used in combination with SoC-e HSR-PRP Switch IP to introduce HSR and PRP capabilities in the ports that are required. HSR switching approach is Cut Through. Thus, the combination offers the maximum performance and maximum compatibility with the standards. MES can be supported on Xilinx Spartan-6 and every 7-Series devices. MES IP Core provides MII/GMII/RGMII native interface for Ethernet PHY devices and it can be combined with Xilinx IP to support SGMII among other interfaces. Full-Duplex Ethernet 10/100/1000base-TX FX interfaces. Configurable 2 to 12 Ethernet ports. MII/GMII/RGMII interfaces for attaching to an external Physical Layer device (PHY). Possible to work with different data rate (10/100/1000base-tx fx Mbps) for each port. Automatic MAC addresses learning and aging (up to 2048 entries). Switching Portmask: User-defined forwarding of frames to concrete ports. IEEE 1588v2 Stateless Transparent Clock functionality (P2P – Layer 2/ E2E – Layer 2). IEEE 802.1X EAPOL hardware processing. Reference RSTP stack for Linux provided with the IP Core. Posix Compatible RSTP stack available. guration. It has been designed to address the maximum throughput using the minimum resources. es each frame before forwarding it. Nevertheless, the latency time has been minimized to nanoseconds order. Furthermore, UESsupports IEEE 1588 V2 Transparent Clock functionalities. 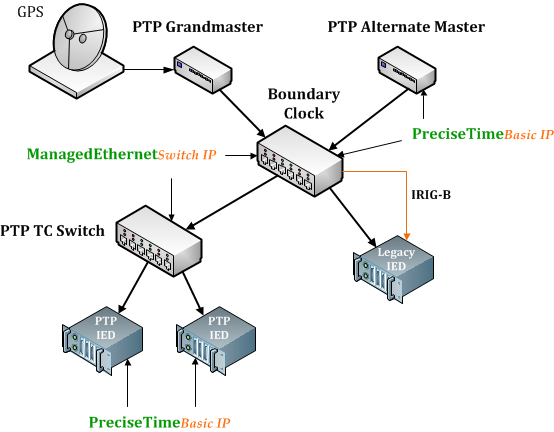 This feature, that corrects PTP frames introducing the error generated by the switch, allows the interconnection of IEEE 1588 synchronized devices maintaining the highest levels of accuracy. UES is the perfect Ethernet Switch IP to implement Ethernet based Industrial Networks. UES can be combined with our HSR-PRP Switch IP to introduce HSR and PRP capabilities in the required ports. HSR switching approach is Cut-Through. Thus the combination offers the maximum performance and maximum compatibility with the standards. Automatic: MAC addresses learning and aging (by default, store capacity of 256 MAC addresses). Media Independent Interface (MII) for attaching to an external Physical Layer device (PHY). 100 Mbps Full-Duplex Ethernet interfaces (Evaluation Design). Gigabit Media Independent Interface (GMII) for attaching to an external Physical Layer device (PHY). 1 Gpbs Full-Duplex Ethernet interfaces. 1588 V2 Transparent Clock functionalities supported (not in the Evaluation Design). The SoC-e PROFINET Switch IP core is an Intellectual Property (IP) Core for FPGAs. It co-works with a PROFINET software stack running on an external or an internal CPU (Microblaze or ARM9). This IP is an ideal solution for implementing flexible Profinet Automation equipments. The reference design implements PROFINET RT CC-B Line Structure integrating PORT.DE Profinet Software Stack. Port A and Port B: they are connected to a Profinet bus. 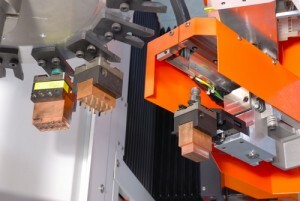 They connect the equipment to a Line topology network. Port C: it offers a conventional Ethernet link to any on-board or external CPU in order to receive Profinet frames. The PROFINET Switch IP Core presents MII interface (10/100 Mbps) towards Interlink Port and towards External Ports connected to Ethernet PHYs. These ports have full-duplex interfaces. The PROFINET Switch IP Core also presents MDIO interface in order to allow host CPU to access the registers of PROFINET Switch and to poll the status of the connected PHY devices. This Profinet Switch IP Core supports up to four priority levels. Taking into account that there are eight priority levels in VLAN, these levels are accommodated two by two in the four priority queues that the core can support. This means that priorities zero and one are priority zero – zero being the smallest one – and priorities two and three are priority one, and so on. Nevertheless, the arrangement can be customized. All the ports have four priority queues enabling four different priority levels. In the case of the External Ports, they have another four priority queues related with the forwarding process. Frames forwarded from one External Port to another one have priority over the frames that come from the interlink. Should there be a congestion situation, old frames are dropped from the priority queues. The External Ports PHYs can be accessed from the CPU through a MDIO bus. The Egress port can be selected by tagging the frames sent by the external CPU. There is also an auto-learning MAC table that helps to reduce the network load avoiding unnecessary duplication of frames. The External CPU can write a static MAC table to forward all the frames with a matching destination MAC address to both interlink and the other External destination port. Time Sensitive Networking (TSN) Switch IP is a non-blocking switching matrix specifically designed to implement Ethernet TSN in Industrial and Aerospace equipment. It can be used as a base for a custom TSN configuration and it can be adapted to support a different subset of the standards. 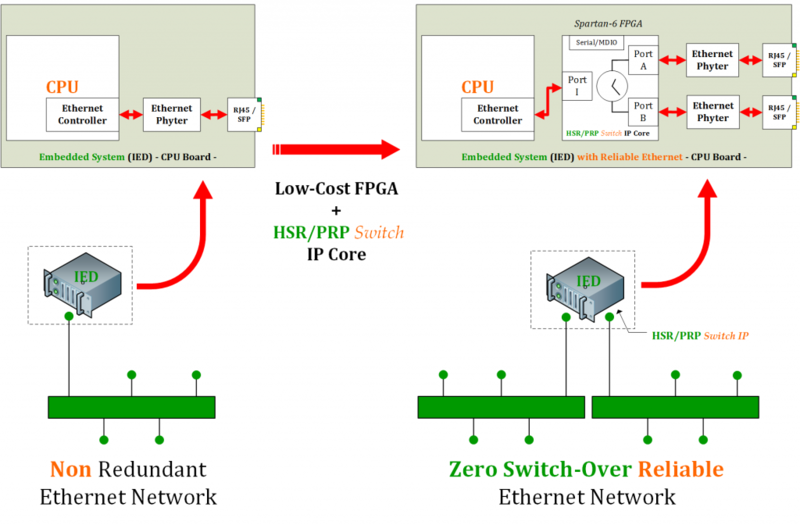 TSN Switch IP Core provides MII/GMII/RGMII native interface for Ethernet PHY devices and it can be combined with Xilinx IP to support SGMII among other interfaces. IEEE 802.AS (IEEE 1588v2 P2P – Layer 2, 802.AS profile). Redundancy: P802.1CB (Standard in draft, technical development in process). Frame preemption: P802.1Qbu (Standard in draft, technical development in process). Schedule traffic: P802.1Qbv (Standard in draft, technical development in process). Traffic policer to limit the excess traffic (the incoming data stream). (Standard in draft, technical development in process). Traffic shaper to limit the transmit rate. (Standard in draft, technical development in process). 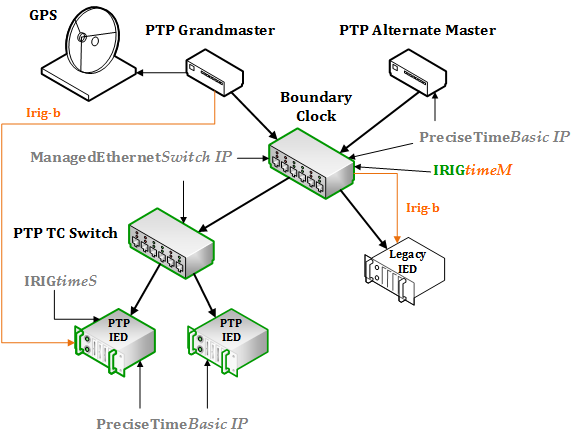 IEEE 1588-2008, also known PTPv2, offers high accuracy clock synchronization for interconnected systems. There are many sectors that benefit from this protocol, like finance, aerospace and industry. A representative IEEE 1588-2008 case-of-use is the adoption of this protocol as synchronization mechanism in the standard for Substation Automation (IEC 61850). In this scenario, the Merging Units sample current and voltage values and timestamp them using IEEE 1588 synchronized timers. The protection relays, IEDs, process these values and reconstruct the status of the grid using these digital values. The IEDs attending this information can apply any control action. 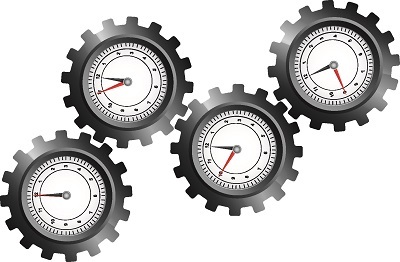 An IEEE 1588 infrastructure requires Master Clock equipment to provide clocking reference, Slave Clocks synchronize with the Master Clocks and Boundary Clocks to communicate different clock domains. Additionally, all networking equipment should be time-aware devices in order to maintain the same level of accuracy in the whole network. In the context of IEEE 1588, the requested featured is named Transparent Clock. PreciseTimeBasic is a IEEE1588-2008 V2 compliant clock synchronization IP core for Xilinx FPGAs. It is capable of accurately time stamp IEEE 1588 telegrams and also to provide a compatible timer. All these processes are carried out by hardware modules. A hardware Time Stamping Unit (TSU)capable of accurately time stamp IEEE 1588 event messages and to provide an adjustable timer with submicrosecond precision. In fact, two versions of TSU are provided with the PreciseTimeBasic: PTB TSU and PTBLite TSU. 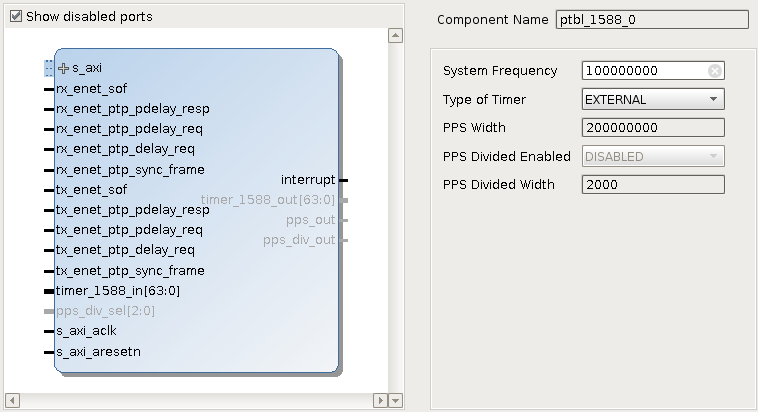 PTB TSU has been designed to be connected to the Medium Independent Interface ([G]MII), between MAC and PHY, parsing all the Ethernet frames and inspecting which ones are IEEE 1588. PTBLite TSU takes advantage of the PTP parser contained in the Zynq GMACs to provide a TSU usingless FPGA resources but with some limitations imposed by the IEEE 1588 hardwired logic on the PS GMAC. Both versions of TSU can use an internal adjustable timer or take its timer value from another TSU. 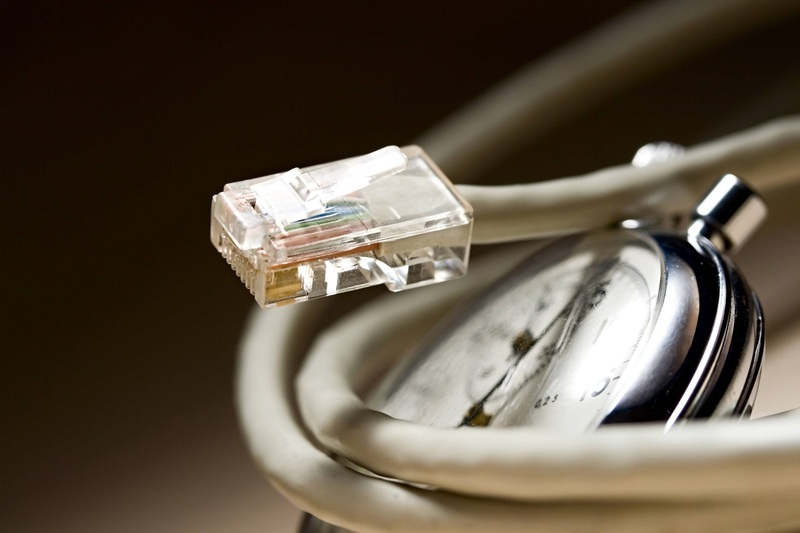 Thus multiple Ethernet connections can share the same timer or different Ethernet connections may have their individual timer. A software PTP Reference Design. SoC-e provides a Linux kernel patch that allow accessing the TSUs using the Linux PTP Hardware Clock (PHC) subsystem. A modified version of the Open Source LinuxPTP software stack with additional features is also provided. Because of its modular design, porting to other operating is feasible. Supports different Xilinx FPGA Families (Zynq, Spartan6, Artix7). The final accuracy obtained in a IEEE 1588 systems depends on many factors (frequency and quality of the local clock, location of the time stamp in the data chain, etc.). 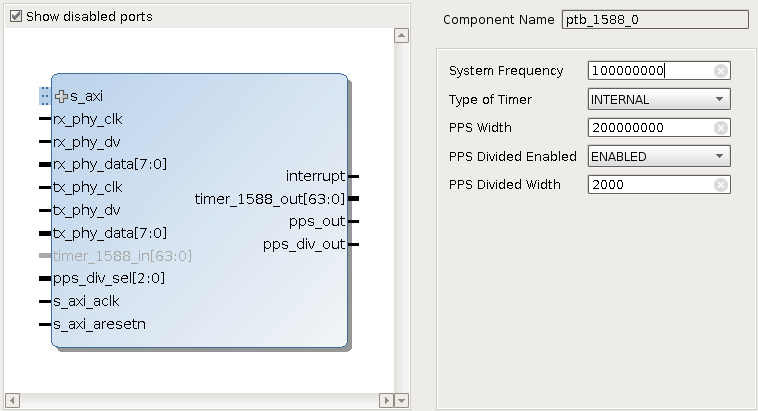 As a reference, next figure shows the measured error between the PPS generated by a Commercial Grandmaster equipment and the PPS generated by a Zedboard Avnet Devopment Platfrom which runs LinuxPTP software stack in the ARM processor and uses the PreciseTimeBasic for hardware assisted timestamping (+/- 30 ns). 1588Tiny is a IEEE1588-2008 V2 Slave Only hard-only compliant clock synchronization IP core for Xilinx FPGAs. It is focused on equipments that requires basic IEEE 1588 functionality using the minimum resources. 1588Tiny is capable of accurately time-stamping IEEE 1588 telegrams and also provides a synchronized clock using only hardware modules. An embedded processor is not required, nor a generic Ethernet MAC. 1588Tiny includes an optimized Ethernet MAC to process PTP frames. It supports Power Profile and IEC 61850 and it can also support other profiles. 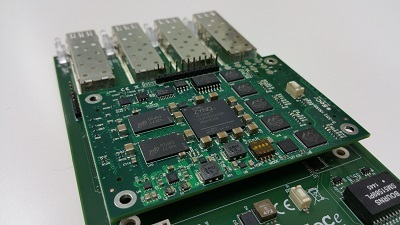 The reference design targets AVNET Spartan-6 FPGA LX9 Microboard. The term IRIG signals is used to refer to a whole group of serial timecodes, which use a continuous stream of binary data to transmit information on date and time. 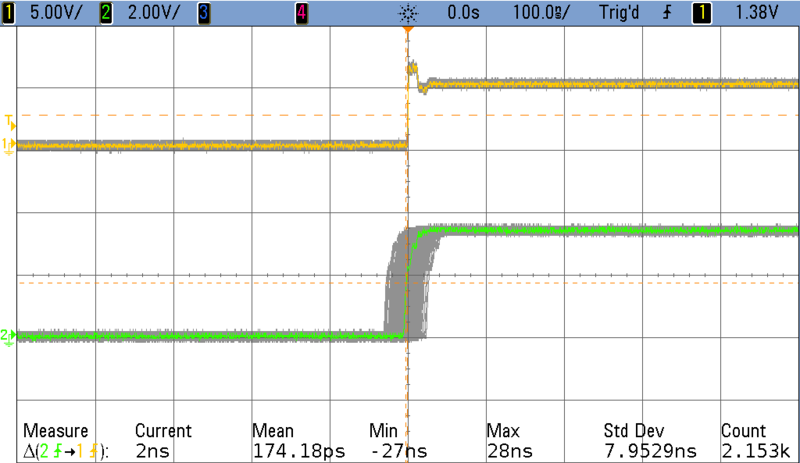 The individual time code formats can be distinguished by the signal characteristics, e.g. modulated versus unmodulated, which require different ways of signal transmission, by the data rate, and by the kind of information included in the transmitted data. Back in 1956 the TeleCommunication Working Group (TCWG) of the American Inter Range Instrumentation Group (IRIG) was mandated to standardize different time code formats, resulting inIRIG Document 104-60. The latest revision is IRIG Standard 200-04 which is the current version specifying some new codes which also transmit a year number. IRIGB is widely used to synchronize systems in Substation Automation Systems (SAS) and in Defence and Aerospace. Nowadays, it is quite frequent combining IEEE 1588 systems with IRGIB systems. The following diagram maps as an example the functionalities of SoC-e timing related IPs of SAS equipment related to synchronization. IRIGtimeM implements an IRIG 200-04 compliant time synchronization master on FPGA devices. This IRIG-B master IP has been designed to support all the IRIG-B coded expressions as well as DCLS and AM modulations in order to provide maximum flexibility.